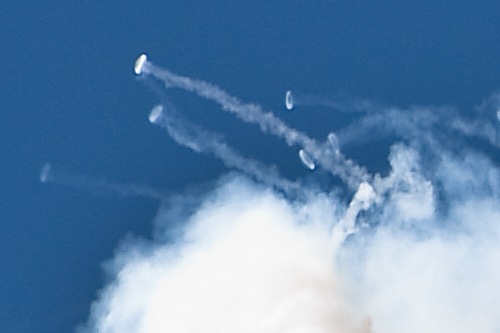 It was only when I saw this photo I took of Zoltan Veres spinning his Extra 300 in full size on my computer screen that I realised the small bright spots thrown off from the main smoke cloud are little smoke rings. I’ve never seen anything like that before. 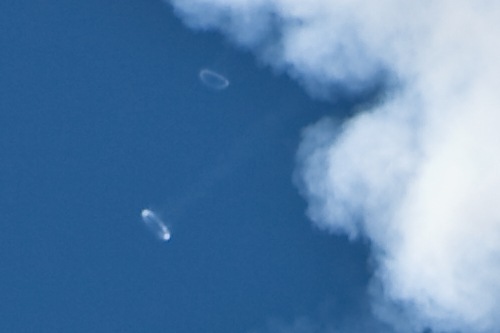 Here are two crops from the full-sized image that show the rings more clearly. Zoltan Veres is an amazingly talented pilot; take a look at these videos I found while looking up info on him. Somebody posted this music video to a list I’m on. It was made after work one day by a fun bunch of geeks. I was in Somerset Mall this afternoon on my way to pick up some groceries. As I walked back from Paper Weight (gotta check for new photo mags every week) I spotted some tables outside the supermarket and assumed them to be from Paper Weight as usual, until I spotted the sign saying DVDs: 2 for R129.95. I have a weakness for collecting older, classic (to me anyway) movies so I had to browse around and see what I could find. There was the usual selection of lame recent movies that someone mistakenly thought people would buy, but I did find four movies that were on my mental “I’d buy those” list. Empire Records, The Commitments, Blade Runner and Seven. I also bought a copy of Celtic Tiger, Michael Flatley’s latest show, for Mela, who loves musicals and dance shows. Of course I had all these in my hands before noticing the small print on the signs. The special I saw applied only to movies marked at R69.95 and none of the ones I had were that cheap. So on my grocery trip I spent R430 that I had not intended to. Damn you, Musid Moods, why can’t you keep your evil temptations in your store where I know to avoid them?